Warsaw, Poland - TODAY - Civil society groups across Africa demanded that developed countries fulfil and implement their commitments under the UN climate convention, in order to fairly share a necessary 'emissions budget', and avoid catastrophic climate change. At a press conference held immediately after the opening session of the 19th session of the UN Warsaw Climate Conference, the group said that Africa is in the frontline for climate change impacts. "We watch with horror what has happened in the Philippines, and know that it is happening in our homes too." Mithika Mwenda, the Secretary General of the Pan African Climate Justice Alliance (PACJA), said. "I don't know how rich countries can ignore the facts being screamed by mother nature, nor the cries being made by the world's poor - the time has come to cut climate changing causing emissions and to cut them deep," Mwende said . "Africans expect our governments to stand firm on setting an emissions budget, as recommended by the IPCC. They must then share this budget fairly, based on historical responsibility and capacities." Said Dr. Habtemariam Abate, from Ethiopian Civil Society Network on Climate Change. "These negotiations are about the emissions budget, whether governments admit it or not, they either negotiate to share that budget fairly, or they plan to exceed it," Dr Abate added. 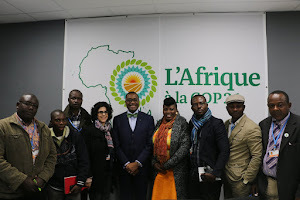 "African civil society has strong and clear proposals for how to deliver energy to those who do not have it whilst avoiding the trap of dirty fossil fuels and therefore allowing us to live within the emissions budget. Proposals include a globally funded feed in tariff - we expect such a measure to be adopted here in Warsaw," Azeb Girmai, from LDC Watch, said. "Warsaw can be the moment the world chooses clean over dirty energy and Africa will be leading in that choice," Girmai, said. "African people need an international mechanism to address loss and damage from climate change. That's the reality. We see it everyday. Perhaps the rich only see it on television - well they need to turn it on, watch it, learn, and then take responsibility for the suffering their emissions have caused." Robert Chimambo, from Zambia Climate Change Network, said. "The best agreement on Earth won't make a difference without implementation in the real world. That's why a clear outcome in Warsaw must be drastically scaled up climate finance and technology transfer. Only if those commitments are met can African governments really believe that the rich world plans to act in good faith on any future agreement." Said Agnes Banda from Malawi, one of the most vulnerable countries. A continental coalition of Civil Society Organizations from diverse backgrounds in Africa, the Pan African Climate Justice Alliance has emerged as the most vibrant and largest Civil Society platform on climate change and sustainable development. With a membership of more than 500 organizations and networks, the Alliance brings together Faith-based Organizations, Farmers and Pastoralists` Groups, Community-based organizations, Non-Governmental organizations, Trusts, Foundations, among other sectors with a common goal of promoting and advocating for Pro-poor, climate-friendly and equity-based responses to climate change.